Our physicians are fully equipped to diagnose and treat the full range of ear, hearing and balance disorders. Licensed audiologists enable the full complement of diagnostic testing to be performed in the office. State-of-the-art equipment such as microscopes, audiometers, tympanometers and hearing aid analyzers enable us to provide our patients with comprehensive care. Hearing aid fitting and dispensing is done in the office by licensed audiologists to ensure optimal hearing health care and hearing aid performance. Our in-office operating suite enables us to perform certain minor procedures in the office. Middle ear infections are more common in children than adults. Children tend to have dysfunction of the Eustachian tube that equalizes the pressure in the ear, contributing to recurrent infections. 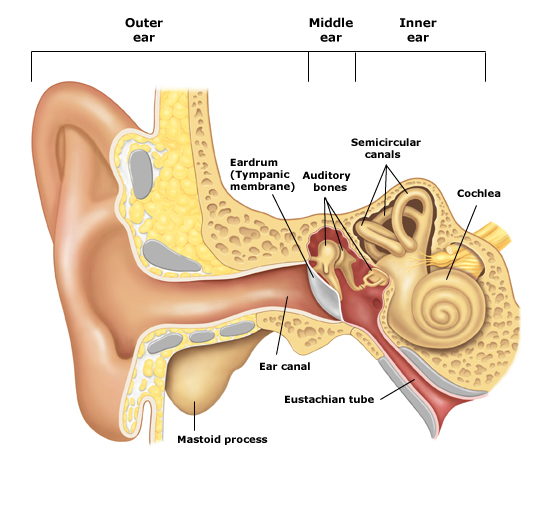 However, the Eustachian tube function generally improves as children get older, and children frequently outgrow recurrent ear problems by the age of eight or nine. Other contributing factors to ear infections can be allergies and adenoid enlargement. Symptoms of a middle ear infection include fever, pain and irritability. When infections are frequent or do not resolve with antibiotics, tubes are placed in the eardrum to improve ventilation. They bypass the Eustachian tube to allow air in the middle ear and keep the pressure equalized. Infections can occur in the skin of the ear canal. Symptoms typically are pain, tenderness to the touch and drainage. Antibiotic drops alone will frequently clear the infections. When infection is more severe, oral antibiotics, cleaning the ear, or placement of a wick in the ear canal to help the antibiotic drops reach the infection, may be required. Evaluation of the ears to appropriately diagnose the problem and start appropriate treatment is important. Perforations of the eardrum usually result from infection or trauma. Perforations due to chronic infection may not heal and can be associated with some degree of hearing loss. Surgical procedures may be required to repair the eardrum (tympanoplasty) and may include surgery on the mastoid bone around the ear (tympanomastoidectomy). Trauma to the outside of the ear can cause lacerations that may require surgical repair. Complex repairs may require staged procedures. Blunt trauma can cause a blood clot to form under the skin of the ear that can affect the blood supply to the ear cartilage, causing distortion and deformity (Cauliflower ear). It is important that this is diagnosed and treated quickly to prevent permanent deformity of the ear. Ear pain is a common complaint and can result from infection, poor Eustachian tube function or temporomandibular joint problems (TMJ). The most common ear deformities are protruding ears. These deformities of the shape of the ear can be corrected with a procedure called otoplasty. This gives the ear a more natural shape and position. Dizziness or vertigo is a very common problem and can occur in children, adults and the elderly. It is frequently described as a spinning motion when there is no movement. Dizziness is not a specific disease but a symptom, and can be caused by a variety of disorders. A thorough head and neck examination including the ears, along with hearing tests, are the first steps in discovering the cause of dizziness. When indicated, specialized balance testing (ENG LINK) may also be performed to further evaluate and treat dizziness.